This week I completed an on-line course Complexity Explorer run by the Santa Fe Institute. In this article I will review the course, but in doing so I also want to explore current trends in education. This article will therefore be of interest not only to those of you who may be looking for a course to help introduce you to complexity science, but it will also be of interest to those of you who are involved in any way in the evolution of education and future trends. I am not going to spend much time explaining complexity theory, but if you do not have a background in complexity theory I am sure you will still gain some interesting insights from this article. The Santa Fe Institute is a private, not-for-profit, independent research and education center, founded in 1984 specialising in the study of complexity and complex systems. It is known as one of the world’s leading research centres in the area of complexity, with researchers covering a diverse range of areas of study such as genomics, neurobiology, viral dynamics, biochemical networks, learning and memory in the immune system, and complex systems in ecology and evolutionary economics. The institute also runs a Business Network which enables members to join from the business community to help spread the knowledge of complex systems and promote the integration of this way of thinking into business practice. Before examining the course in detail, I wish to discuss a few slides I found inspiring by the creative agency Sparks and Honey (the slides can be seen in full in the reference section at the end). 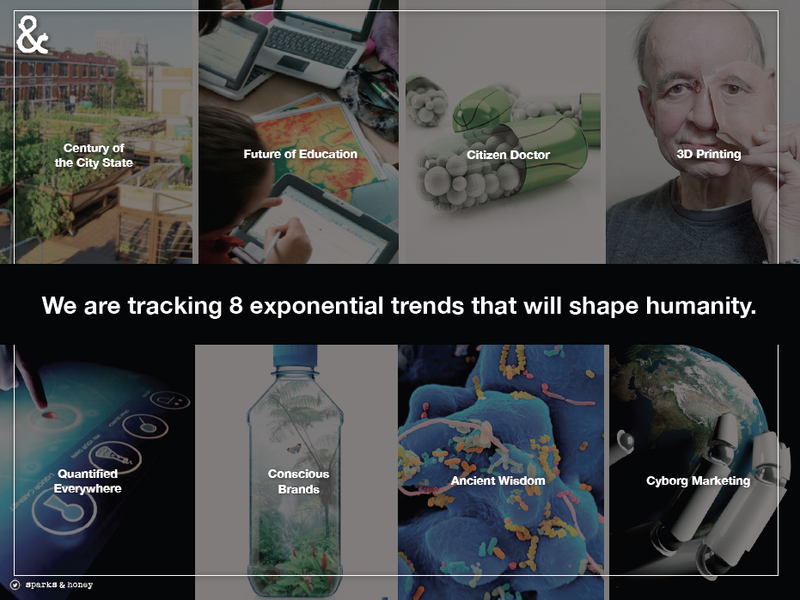 Sparks and Honey are tracking eight major ones which they see will impact on our realities exponentially, one of them being the future of education. Their perspective is that education is becoming less about the actual grades, and more about us being able to explore multiple avenues in our lives. Careers become less structured as people equip themselves with a wider range of skills. One way of achieving this is via MOOCs – Massive Open On-line Courses, of which Complexity Explorer is one, allowing people to blend life-long learning into their careers. So now on to the actual course. Complexity Explorer began on the 2nd April of this year and is scheduled to close on the 30th June, the last day for submitting the final exam. It is made up of twelve modules providing a comprehensive introduction to complexity science, examples being dynamics and chaos, fractals, genetic algorithms, self-organisation, scaling and networks. In the middle of each module there are on-line tests to enable you to check your understanding, and at the end there is a homework, the marks of which go towards your final score. Students must receive an overall score of 60% in order to receive a certificate from Santa Fe Institute. The course is free to enrol on, although there is a suggested donation of $20 in order to fund future courses. As someone who is already a lecturer and consultant in helping business and organisations solve problems using complexity and systems thinking I should probably explain a little of my own motivations for doing this course. 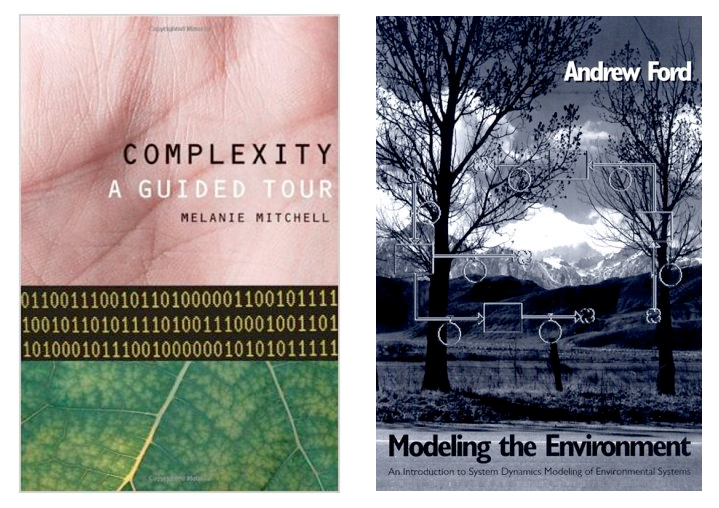 I studied complexity as part of my masters degree in Holistic Science from Schumacher College. I was lucky to have two weeks of lectures on Gaia theory and modelling from Stephan Harding, the course director who is also an ecologist and long-time collaborator with James Lovelock who first had the inspiration for Gaia, and we spent much time exploring this via Daisyworld, a simulation of a complex ecosystem created by Lovelock and developed further by Stephan. The philosophical basis for Holistic Science is a deep exploration of wholism, examining the relationship between the parts and the whole in systems, and this profound way of thinking and seeing goes far beyond rational and intellectual modelling and into other ways of knowing such as sensing, feeling and intuition. Although the Holistic Science course does explore the many facets of complexity science, the focus is on exploring process and meaning rather than developing expertise in the computer modelling of complex systems, and this therefore was an opportunity for me to really brush up in this area. A couple of years back I bought the book Modeling the Environment in order to start to teach myself to build and play with computer models. While the book is absolutely excellent, it is perhaps more suitable as a course textbook for students who are currently taking a modelling course and who have instruction in physical classes. Although the book discusses how to build models with a range of software, it is more Microsoft focussed than Mac focussed, and I did not manage to build a single model. My experience on Complexity Explorer however has been quite different. The course instructor is Melanie Mitchell, Professor of Computer Science at Portland State University, and External Professor and Member of the Science Board at the Santa Fe Institute. She is a well-known author and researcher in the fields of artificial intelligence, cognitive science, and complex systems and her most recent book is Complexity: A Guided Tour published in 2009 by Oxford University Press. 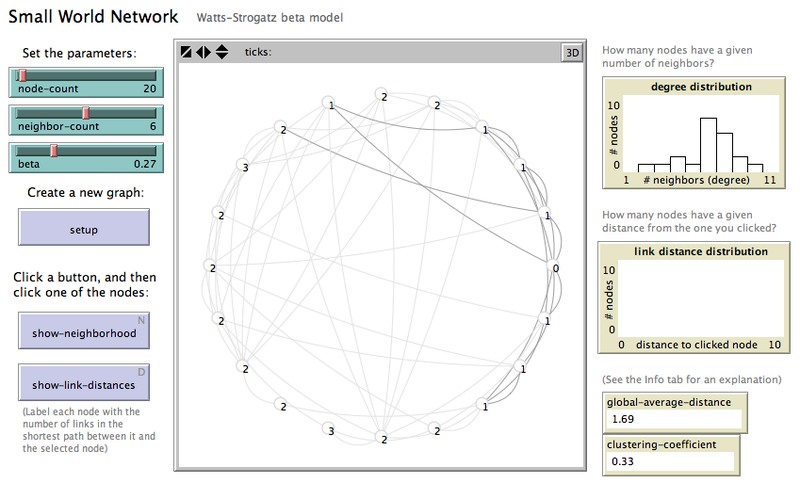 After a short discussion of complexity science in general, the first module dives in with a discussion of Netlogo, a free open-source Java-based multi-agent programmable modeling environment. This is used by thousands of teachers and researchers to build and share simulations of complex systems, and is the single platform used on this course. Although I did very well at maths at school and had degree level statistics which I needed for my degree in Psychology, much of this including my great ability to solve differential and logarithmic equations has been forgotten. I also played around with Basic in my teens, and have taught myself some HTML for creating web pages, but I am in no way a programmer. The pacing and content of the first few modules by Melanie were excellent. She introduces the workings of Netlogo and students are taught how to do some very elementary programming. This was wonderful for me as I could really gain an understanding of the architecture and workings of Netlogo, while advanced level programmers and mathematicians were also given more advanced optional homework and exercises too. I have read many books on complexity, but one thing I had never been able to do was to be able to explore dynamic equations in computer simulators. On most of the modules of this course various different models are examined, which can be downloaded from the course materials page. 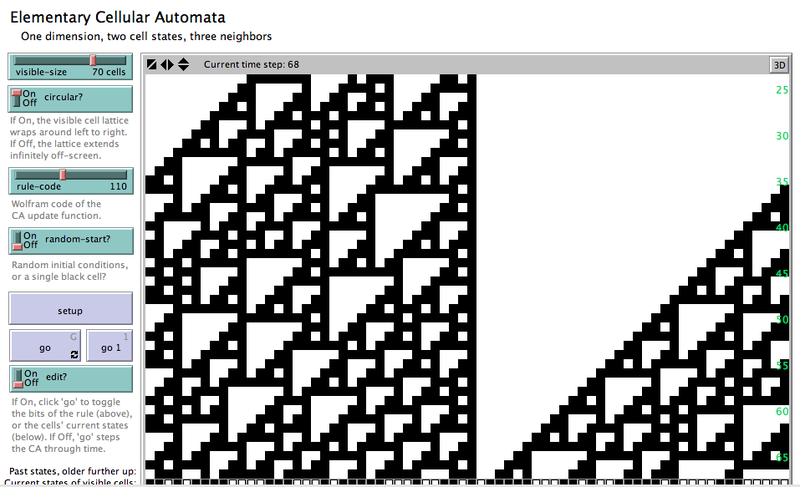 This was a delight for me as I could now play with various non-lineaer equations which while I could understand mathematically really need to be played with actively to appreciate their complex behaviour. 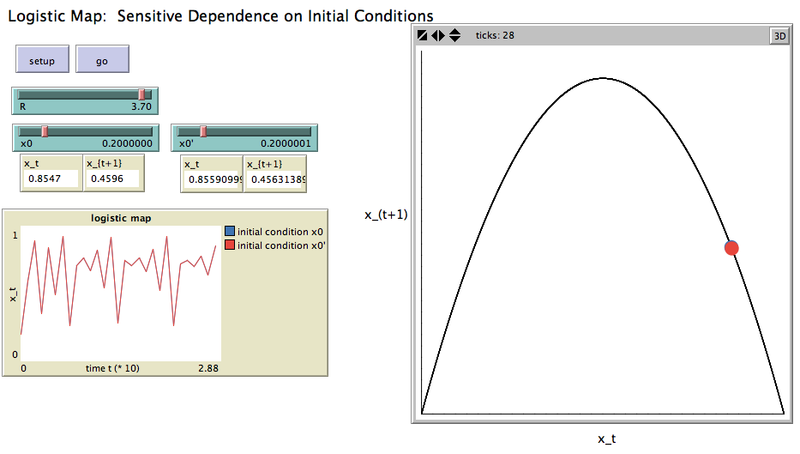 An example of this is the bifurcation application seen in the screen shot above. 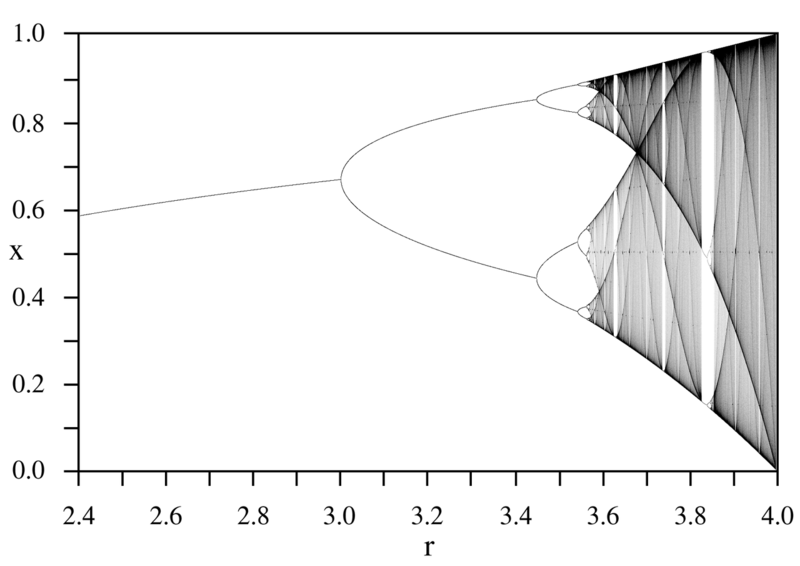 This is the equation which generates the bifurcation diagram seen below, and using the software allows you to explore, play and experiment with the equation and its behaviour. 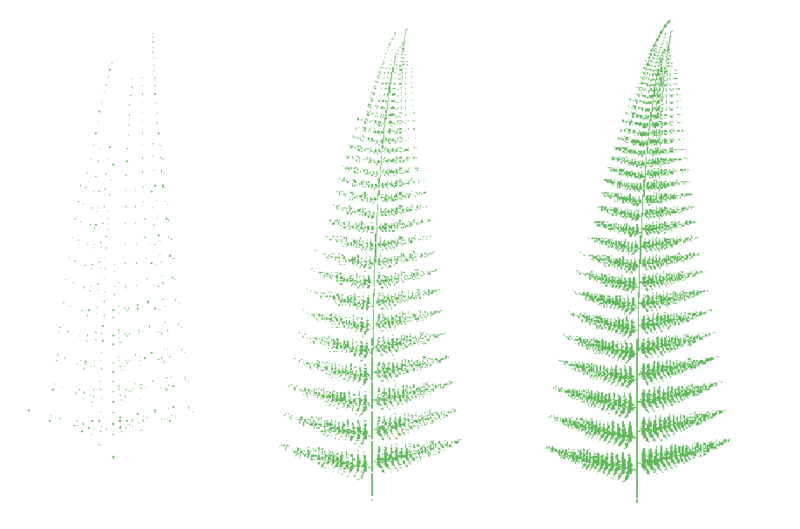 One particular equation which was not discussed on the course but which is a bit of a favourite after having been taught it from my teacher Philip Frances at Schumacher College was the Barnsley Fern. I really appreciated having a number of students on the course who already had advanced programming skills, since via the forums I was able to ask if anyone could write this in Netlogo. 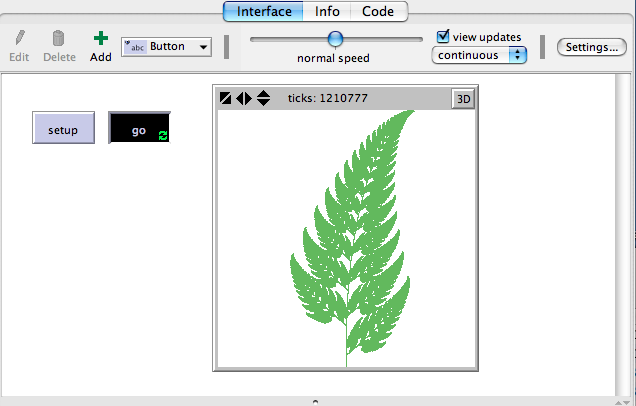 Two students readily offered, with one coming up with an elegant solution which others also could learn from, and I was then able to play with and “grow” my own new ferns, now having the knowledge of how to alter the equations in the editing part of the software. 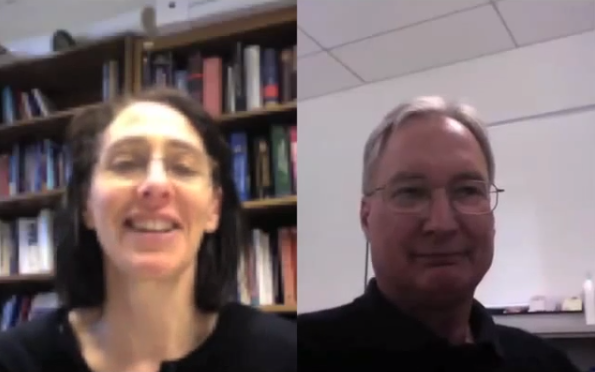 As well as Melanie, each module featured an interview via Skype with a leading expert in the field of complexity science being discussed. This on the whole worked extremely well, and the forums gave students the opportunity to follow up what was covered with their own discussions. The suggested amount of time to be set aside for the course was between 3 – 6 hours each week. This time also included time spent doing the homework and also reading the extensive course material in the form of academic papers which were free to download, as well as suggested books for those wishing to go deeper into any specific area. The course ended with a virtual field trip. This was a tour of the Santa Fe campus, and it was great to really see the institute for the first time, especially as I have read so much about it over the last few years. It reminded me quite a bit of Schumacher College, and the surrounding and environment seem highly conducing to the creative thinking in the melting pot of minds who meet there. I completed the final exam this weekend and immediately received my certificate. The final exam consisted of 50% of the overall score, and like the other tests was multiple choice. The course had lasted a few weeks longer than had originally been planned, and it was in fact useful to go back to the earlier units doing the exam as there were a few technical aspects I needed to brush up on again. I wanted to write this review in order to describe my experiences on what surely will be one major new dimension of education over the coming years. My own MSc in Holistic Science at Schumacher College was a monumentally powerful and immersive learning journey, a course which itself is almost unique I think and also at the cutting edge of educational practices, being developed from a philosophy of transformative learning. On the MSc the emphasis was on contemplating complexity from a more philosophical perspective, and of course a MOOC can not in my own mind replace this type of learning. But what it has shown to me is the importance of hacking our educational paths, and the need to continually update, revise and engage in learning, and the MOOC very much complemented my own experiences at Schumacher. Summing up it has been amazing to take part in this course. There were of course a few minor teething problems, a few minor technical issues with videos and also a few of the modules were posted later then originally planned. But these did not affect the experience of the course, and lessons have been learnt and feedback received which will mean the next version of this course should run near flawlessly, currently scheduled for mid to late September. There were many different students with many different backgrounds and motives for taking this course, and the forums have been full of praise for Melanie and her colleagues at Santa Fe who have put the course together. I can see that you are a fan of “Tristram Shandy”!